A report I share each month of the progress to my wealth building portfolio of stocks and mutual fund position added with reasons and contract notes to remain fully transparent. I also share important lessons I learn along with the plans for the coming month. Note: This is not my complete portfolio and has other investments in more volatile and high beta stocks which I don’t recommend to others. June has been a month where I did quite a few changes to the portfolio and then there was BREXIT which also forced me to switch stocks. Again I Invested lot more than 50k in June because the market is providing lot more opportunity. I see better opportunity in Jubilant Foodworks over Infosys. Jubilant is focused on increasing market share and it is very good for any business in the long run than just profits. I could be wrong but I like to take that bet. I don’t expect PE expansion in Infosys so it would be more like a consistent performer around 10% to 15% than a wealth builder. Management’s outlook was not very positive in a recent interview and this could mean a high PE valuation can become tough to sustain. Time and again Infosys management keeps cooling the share prices from rising too much by dampening expectations. May come back to Infosys in the future. Contract notes of 16 June 2016. Capital invested in Infosys moved over to Jubilant Foodworks because I see more positive outlook for Jubilant Foodworks as a business over Infosys because they are more keen on increasing their market share. Market share growth means the share price of the stock will have pressure because they will not be making more profits in the coming quarters but may only have increased sales. I really like to take my chances and invest more heavily in the company who is focused on increasing market share over a consistent performer with good results already priced in. JFL may be a dampening factor in our portfolio’s performance in the short term but I am ready to accumulate as well as wait for a long time to turn the market share into profits. Accumulated 5 on 2nd June (Contract notes here), 20 more on 15th June (Contract notes here) and 50 more on 16th June (Contract notes here) when sold Infosys. After 4 months, I think it was time for Zydus Wellness and I added 25 on 2nd June (Contract notes here) and also used BREXIT crash to add more position in Zydus Wellness on 24th June (Contract notes here). Britannia Industries is a new entry in our portfolio and looks quite good to me at around 2600 levels for a very long term. Market leader in Biscuits, available at 40 PE multiples with 6 months of correction in the range of 2500 to 3000. As always I look at the 7 point fundamental analysis for any company and here is the analysis of each point of my analysis for Britannia Industries Ltd. Unique business and market leader in Bakery Products. There are no government policies that control such products. Simple business which is to have more bakery, diary and cakes products to suit India’s need. The company has an awesome track record for sure and is in business since 1892 and may in future look to go international. The company has a consistent dividend history. Very capable and experienced management with right blends of aggressiveness to keep growing market share with the right kind of products and marketing. There is no debt (not even a single rupee) in the company and has an awesome return of capital employed. There are a couple of points to consider as well. It has run up in an almost a straight line in the last couple of years from 800 to 3400 and so it would need some time wise correction as well as price correction. No debt with a market leader and growing market share will not be available for cheaper valuations for sure. Blue line shows support for Britannia Industries which is around 2500. On Friday 24th June, because of BREXIT there was a crash in the market but Britannia Industries took support with a low of 2520. So I switched over my investment from Tata Steel to Britannia Industries. Just to let you know there is no major technical support below 2500 and only intermediate support at around 2000. So make sure you are not getting into this stock on technicals and if you do, have your stops at around 2500 or 2000 as strict. Have purchased 45 Britannia Industries on 24th June 2016 (Contract notes here). June was eventful. After Infosys, I had to book profits in Tata Steel as well. I even emailed all my readers about my profit booking in Tata Steel as soon as I executed the trade. Invested in Tata Steel for a couple of reasons. First steel demand increase over time in the world and second Tata group to sell its UK chorus plant in the coming years. 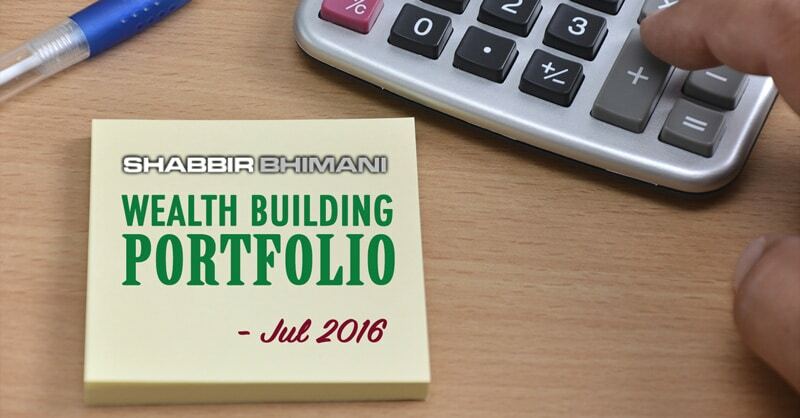 You can read about it in Feb 2016 Wealth Building Report here. So now, with political uncertainty in the UK, Tata Steel can have issues selling its asset. We already see David Cameron resigned and there can be other chains of event that can bring even recession in Europe (I am not expert at guessing that but what I see in the news). What we can assume is commodity prices uncertainty and can cool off as well as Tata group can have issues selling its UK’s plant and so may need to take lot more losses before they can sell off. So I would remain away from Tata Steel as of now and would like to remain invested in companies that are more focused towards Indian market than the European market. I sold all my investment in Tata Steel and switched it over to Britannia Industries. Contract Notes from 24th June here. Increased our portfolio investment from ₹ 3,84,668 to ₹ 4,41,146. An increase of ₹ 56,478 in the month of June. Let us now see the performance of the portfolio built so far. I think I over reacted to management views on Infosys as well as news of Brexit for tata steel but it happens all the time and even when I wanted to purchase L&T in April. I react too much but need to learn to be less reactive to investments. Note if I look back today, I don’t think the reaction would have been different and I would have eventually sold both Infosys and Tata Steel for sure but I could have sold them at a slightly better price. I will wait for a market correction for entry in L&T and don’t think it is the right price to be adding more L&T to our portfolio. It’s the right stock to be investing in and the right time but then it’s not the right price. I don’t see the right price coming anytime soon either unless we see a few more events like BREXIT. Till then will accumulate Zydus Wellness around 800, Britannia Industries around 2600 and be less aggressive on Jubilant Foodworks in July. As always I’d love to respond to any questions or comments that you may have. Thanks!